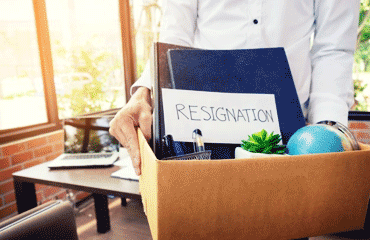 You don’t have to give a reason when you resign, but under some circumstances, you may want to let your employer know why you’re moving on. Your letter of resignation is a formal method of communicating your intentions to your employer. No matter your occupation, whether a teacher, medical professional, engineer or accountant, by utilizing a resignation letter, you are stating your intention clearly and professionally. By taking advantage of the following sample letters, you should garner a good idea of how to compose your letter. Inform your employer that this is a formal or official resignation letter, giving the date of resignation. Include two weeks notice. This is where you state your appreciation and gratitude for the opportunities you’ve experienced during your tenure. State that you are more than willing to assist with the transition period in any way possible. I am writing this to inform you of my formal resignation from (Position Name), at (Company Name). This resignation will be effective two weeks from (Current Date). I truly appreciate the variety of opportunities for growth I was afforded during my employment, at (Company Name). If I may be of any assistance during the upcoming two week transition period, please contact me at your earliest convenience. When it comes to composing a letter of resignation for nurses, consider showing gratitude to not only the clinic, but also your fellow nursing staff members. This shows a level of professional respect for your colleagues, as well as your employer. I am writing this to inform you of my intention to resign from my position as head nurse at Rosewood Clinic. This will take place two weeks from September 23, 2022. I truly appreciate the opportunities presented to me at Rosewood. I learned much during my decade of employment at Rosewood, as well as coming in contact with an amazing nursing staff. Working with the patients and their families at Rosewood has been an absolute joy over the years as well. During this time, I’ll make certain that all of my work is up to date, and fellow staff members are made aware of any details which may need attention after my employment ends. I’m quite certain that Rosewood Clinic will continue to spearhead medical advances, as well as promote excellent patient care. The following letter is an example of a retirement letter. When announcing your resignation due to retirement, you are essentially signalling the end of a lifelong career, including those you’ve worked with. As such, it’s perfectly acceptable to show your feelings toward your colleagues. This letter is to inform you of my formal resignation from my position on the Board of Directors for ACME Company, effective two weeks from September 21, 2022. As I am near retirement age, I feel it is time to pass the torch, as it were, and move myself and my wife to our home in San Francisco. I am grateful for the opportunities received from my 10 years at this position. The support and encouragement from my fellow board members has always been a positive force in my life. Even though I’ve moved on, I will always be available for consultation in the future, if needed. What the board has been able to accomplish during my tenure is heartening. Always know that I support the goals of the board, past, present and future. Feel free to contact me if you require any assistance during this transition period. My sincere best to yourself, and the remaining board members. When composing a teacher resignation letter, it is perfectly fine to mention the joy you experienced with your classes. Don’t be afraid to open up here, when it comes to expressing the gratitude to students, employer, staff as well as parents. Please accept my letter of formal resignation from the position of third grade teacher for Wylie Elementary School. This resignation is effective 2 weeks from October 1, 2022. During my employment at Wylie Elementary, I’ve been most fortunate and appreciative for the contacts I’ve made at Wylie. I’m most certain that Wylie has cemented my foundation in a positive manner. I found working with each and every student and their families an absolute joy during my tenure at Wylie. Great satisfaction was to be had working on intramural sporting events, volunteering to head group field trips, as well as working with fellow staff members on projects. If I may be of any assistance with regards to the two week transition period, please do not hesitate to contact me immediately. So far, all of the work is completed, and the classroom schedule is up to date. I will also be available after my departure if you have any questions regarding students or coursework. The volunteer resignation letter need not be as formal as one for employment. Here, you are free to address the organization in a more informal manner. Always express gratitude, especially if the volunteer experience lead to a paying position. Please accept this letter as my resignation from the volunteer post I’ve occupied for the last three years, as a paid occupation was recently presented to me. This resignation will be effective two weeks from October 2, 2022. During my time with this shelter, I’ve been fortunate to garner enough experience to become employed as a full-time K-9 trainer. Without your guidance, support and encouragement, this would not have been possible. As such, I am very grateful. If there is any way I can help during this transition period, please do not hesitate to let me know. I wish both you and the shelter staff the very best in your future endeavors. Also, I’ve left mention that I’ll be more than happy to help out with any bake sales, or fund raising activities in the future. As stated, giving a reason for leaving is totally optional. Here, the individual is planning on pursuing other goals, one being education. While not necessary, it is seen in some circles as an example of being professionally courteous regarding your exit. This letter concerns my resignation from your banking establishment. Please consider this my formal resignation, from my position as teller effective two weeks from 9/24/2022. I’ve found my stay at Pinewoods bank to be a most educational one. This experience allowed me to learn and grow within the banking industry, and for that I am appreciative and grateful. The mentoring I’ve received at this financial establishment has made it possible for me to move forward with my own goals, one of which is to return to school part-time to obtain a degree in finances. If I can be of any assistance during this two week transition period, please do not hesitate to ask. I truly do wish you, the staff and Pinewoods bank, the very best in the future. If you are employed at a medical establishment, then make certain that you are aware of the proper notification time before you compose your letter. This is important, as your letter goes on file, and you need to show that you’ve followed the rules set forth by your clinic or hospital. If you cannot remember, simply contact your HR department for clarification. This letter is in regards to my official resignation as head of pediatrics, at Rosewood hospital, which is to be effective two weeks from October 1, 2022. It was during this period where I learned the importance of team work in achieving my goals. It was under the guidance of Rosewood, where I found my potential, so I express my gratitude to you most heartily. I would like to take this time to express my sincerest gratitude to my colleagues for their continued support during my tenure at Rosewood. Please let me know if you require my assistance during the upcoming two week transition period. I assure you that all of my responsibilities have been handled. Again, I wish you and Rosewood the very best with regards to your future. This resignation letter is one where the individual is planning on leaving to attend school full time to obtain their masters degree. It is important that this be an exit strategy where a door is left ajar in case the individual wishes to return to their place of employment once school ends. I am writing this letter to inform you of my decision to formally resign from the accounting firm of Tred and Trimble, effective two weeks from October 4, 2022. After much deliberation, I’ve made the decision to obtain my masters in accounting. In order to accomplish this, I have decided to attend University on a full-time basis. Please know that I am truly grateful and appreciative of the opportunities I’ve been given with this firm. Without these responsibilities and opportunities, I would not be able to have reached my current career goals. If I can be of any help during the two week transition period, please feel free to contact me, and I’ll be more than happy to oblige. This includes helping to train my replacement so they’ll be able to quickly and easily learn the basics of the position. When you compose your letter of resignation, remember that it will go on file, so be courteous, remembering to follow company protocol set forth regarding resignations. For instance, say you need a reference a decade down the road, even if none of your fellow co-workers or supervisors are left, your resignation letter will still be on file. This letter is to inform you of my official resignation from the engineering firm of Clybourne and Clippe, at the start of the new year, on January 1, 2023. As per company protocol, I’m giving you the required notification time. I’ve recently been offered and accepted a position as lead engineer at an overseas company. The valuable lessons learned at Clybourne and Clippe helped to make me the engineer that I am today, and for that I am eternally grateful. Thank you for your continued support over the years. I am more than willing to assisting with the transition of my responsibilities in order for the firm to continue to move forward after my departure. The temporary resignation letter is just that, temporary. Use this when going on sabbatical, of to take care of personal issues. After all, you will be returning. Here, remember to also include your return date, if known. This letter is in regards to my temporary resignation from Cobalt and Wise in order to take the sabbatical offered. This temporary resignation is effective two weeks from 9/24/2022, which should give human resources enough time to hire a temporary fill-in. I will be returning to my position on June 1st, 2023, as agreed. This sabbatical will not only benefit myself, but also the company, as I intend to bring back a great deal of valuable information with regards to procedures, as well as establishing important contacts. If you require any assistance during this transition period, please feel free to contact me at your earliest convenience. We all know the importance first impressions make. However, it should also be taken into account the importance of a proper exit strategy. Keep in mind that your letter should be respectful, professional and courteous at all times. Under no circumstances should your letter have any negative elements. Keep it short, concise, and well-mannered in tone. This letter will go into your employee file, so a professional and graceful exit is of the utmost importance.